Kazakh Prime Minister Serik Akhmetov has held talks with his French counterpart Jean-Marc Ayrault during his working visit to France, Kazakh Prime-Minister's press-service reported. "The two prime ministers discussed the topical issues of expanding trade and economic relations, investment, cultural and humanitarian cooperation," the statement said. "France is Kazakhstan's key partner in Europe," Akhmetov said. Jean-Marc Ayrault in turn appreciated the level of bilateral relations and expressed confidence in further fruitful cooperation. According to Kazakh Prime Minister, a number of joint projects in the field of alternative energy, machine building, metallurgy, electronics, chemical industry and technology transfer are scheduled for implementation," Akhmetov said. The Kazakh Prime Minister told his counterpart about preparation for EXPO 2017 in Astana and invited the French side to take an active part in this international event. The sides expressed willingness to intensify the cooperation in oil and gas sector, car manufacturing, nuclear power industry. In 2012, trade turnover between Kazakhstan and France amounted to $6.2 billion (Kazakh export hit $5.63 billion, import - $584 million). 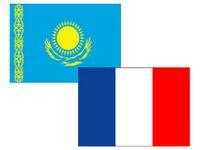 Kazakhstan exports oil, metals, chemical products to France. Kazakhstan imports industrial equipment, medicines, cosmetics, cars. Gross direct investment from France to Kazakhstan's economy has been about $10 billion since 1994.